In the early days of digital music, stores and services fell over themselves to boast about their burgeoning catalogue sizes. Back then, when majors didn’t license widely, it really was something of an achievement to break the 1 million tracks mark, catalogue size was often a good indicator of the comparative breadth of choice among services. But by the second half of the last decade, most of the majors had most of their catalogue online in most of the stores and services. Independent labels lagged for a number of reasons but the majority of the independents (by market share) were also on the majority of services by this stage. And yet since then, the average catalogue size of digital music services has grown from 4.3 million in 2008 to 16.4 million in 2012. What fuelled this new catalogue arms race? It would be nice to think it was down to labels digitizing vast quantities of back catalogue, or even because of a surge of semi-pro artists. The answer though, or at least the lion’s share of it, is much less appealing. Digital catalogues are so much bigger now because of filling and fluffing from covers, tributes and karaoke tracks. To test the theory I looked at the available tracks on iTunes for 10, randomly selected, top tier artists (see figure). The startling key takeaway is that on average just 10% of the tracks listed for an artist is actually music by that artist. And bear in mind that many of those tracks are duplicates. The average U2 song for example, is listed multiple times ranging from original albums, remastered albums, EPs, greatest hits, compilations etc. The vast majority of the remainder of tracks listed for an artist is filler drivel, endless cover versions, tribute acts and karaoke tracks. As Peter Robinson highlighted in 2009, many of these cover versions sound all but identical to the original, while others have full intent on being identikit copies but poor musicianship and production leaves them sounding pitifully poor. In among there are the occasional example of leftfield creativity, such as ‘Bass Parodies of Coldplay’ by Joe Bob’s Upright Bass Trio. But artistic expression is hardly being tested with the likes of ‘Yoga to Coldplay’, ‘Led Zepellin Lullabys’ or ‘Dance Tribute to Lady Gaga vs Black Eyed Peas’. So just how much of the current 16.4 million songs on digital services are ‘the real deal’? Back in 2008 24/7’s CEO Frank Taubert stated that 66% of his service’s 4.5 million tracks had never even been downloaded once (and remember these are the guys who power the vastly successful TDC Play unlimited free music service). That means that just 1.5 million tracks had been played, which is pretty close to the 1.6 million tracks we get if we apply the 10% rule across the entire 16.4 million catalogue count. The number is probably bigger than that though. eMusic responded to Taubert’s 66% claim with their own: that 75% of their 4 million tracks had been downloaded at least once. But even if we take a straight average of the two (i.e. 44% of catalogue is untouched) we are still short of the complete picture. Because even those tracks that have been played at least once will include multiple versions of the same song (e.g. album version vs single version). Nielsen underscored the dynamic in 2009 when they reported that 3.6 million tracks sold less than 100 copies and just 1% of tracks were responsible for 80% of sales. It is at this stage we start to see the core of the problem. The short head will always dominate the long tail, but no more so than when the genuine long tail (the experimental artists, the up and coming, the niche genres) gets drowned out by the pseudo long tail of karaoke and 3rd rate covers. Discovery in the long tail is already a potentially market-crippling problem. It is time for music services to stand up and be (down) counted. 16.4 million songs means nothing if the vast majority is useless filler. This is not to say that there isn’t a place for this strata of bottom-feeder music, but that place is not as part of the main results of original artists. At the very least music services should file those tracks away in their own section. But even if they can’t bring themselves to do that, they should stop listing these tracks in total catalogue sizes. 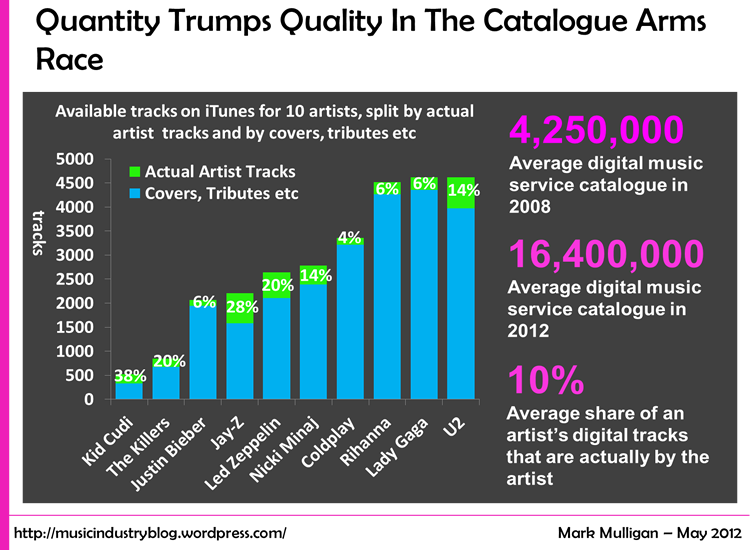 The 90% filler tracks paint a misleading and confusing picture of digital music availability. The best solution of all though is for music services to do away with them all together, and if there is really a market need for them, then let some niche player fill that gap instead of blighting real music services. This entry was posted in Music, music retail, Music Strategy, Paid Content and tagged Cover Versions, Long Tail, Music Services, Pseudo Long Tail by Mark Mulligan. Bookmark the permalink. Take a bigger sample and you’re likely to draw a different conclusion. Well known and popular songs may have covers and tributes, but less popular songs are far less likely to have those extra versions sitting in catalogs. So the 90% estimate holds only for relatively few titles. The glut of recordings is the result of global digital distribution. Catalogs have grown as digital distributors have made deals with labels around the world and pushed their catalogs to digital services. There is evidence this growth is slowing as there are fewer new catalogs to acquire. According to Nielsen, there were about 76,000 new releases in 2011 in the U.S. (Nielsen counts albums that sold at least one unit, so it’s not a number for new releases). That number was 106,000 in 2008, 96,000 in 2009 and 75,000 in 2010. There may be other explanations as well (although I don’t think these can account for vast increase in catalog sizes). For example, there are probably more single-track releases and EPs as artists take advantage of digital distribution to get away from the album format. In addition, many albums now come in multiple versions (which you alluded to). Many major-label releases follow these trends — there could be two or three singles released from an album that comes in a normal and deluxe edition. Glen – I agree that digging deeper into the long tail would give different results, both more in favour of the argument, and against. But the key issue I’m trying to address here is the way in which this filler catalogue is used to fill out the mainstream of digital music services. Only a small fraction of total catalogue accounts for the vast majority of sales. So the challenge for music services should be how to persuade music fans to dig deeper into that long tail of catalogue, not to obscure it with bottom-feeding dross. The short head though, is what attracts this type of content most of all. With regards to the new releases tracked by Nielsen, those stats will miss the majority of this bottom feeder content. There are recording studios who pump stuff such as session musician jams, wannabe vocalist sessions, covers etc straight into digital distributors. This is what pumps up the song count but never gets tracked as actual album releases. The left-hand scale should presumably be just ‘tracks’, not ‘million tracks’. Mark Mulligan’s Twitter gives the number of ‘Lady Gaga’ tracks as 4617, of which 264 are tracks by Lady Gaga herself. my 2 cents: As cover in the rap music genre are quite rare, i would suggest that kid kudi, Minaj and jay-z stats are mainly related to guest featuring on other people’s songs. This is also true in the music electronic genres. For those artists I counted any collaboration as original artists. So all of the filler tracks are the same categories as other artists. You’d be surprised how many there are. Gems like 80’s Retro Re-Mix Tribute to Nicki Minaj, and Hip Hop Stars in the Style Of. Excellent article, Mark. Interesting to see those numbers. Part of the problem, from my view, is not just the studios and labels pumping jams and various sound a likes into the systems, but the artists themselves… well, we should hardly call them ‘artists’. Music is the new Polaroid Camera. Anyone that can play a guitar can put it up an album recorded in an hour on CDBaby and clutter up all the long tail services. In fact, companies like Tunecore, CDBaby, Soundcloud and Reverbnation encourage it. There are plenty of “how to sell your music online without a record label” companies exploiting the desires of all age groups to ‘live their dream’. We work with plenty of those vanity projects at our studio and have for 20 years. Whereas before the barrier of entry was very steep financially to record and manufacture a project, now you can put it online with an iPhone. In my estimation, the real barrier to entry is the marketing piece and the resilience to develop a community. Most ‘artists’ have their hopes dashed when they find out that ‘record it and they will come’ doesn’t exist without significant time and money in promotion. Few think beyond recording their songs. I’m not opposed to the Polaroid and let everyone have a go at being a successful artist. I believe this problem is temporary and will week itself out with differentiated products and niche markets. 15 years from now, we’ll have a new system that will probably look a lot like 1950’s music labels with A&R, promotion and marketing. Historically, this looks a lot like the early days of radio when everyone had a radio station. Then came advertising. 🙂 Eventually, it boiled down to just a couple of networks and lots of listeners. Our products are differentiated by high resolution audio… stupidly big files that are 40x the size of mp3s. We have a small catalog but I can say that less than 1% of our titles have not sold a download. The artists you picked are probably not a good representation of the entire digital music catalogues. 90% of covers, tributes and karaoke versions seems a bit excessive. A more thorough study would probably lower down this figure. Although these tracks (covers and tributes) may, to some extent, account for the size-growth of music catalogues, they copy well-known songs and artists. Therefore they tend to crowd the top head of catalogues, not the long-tail. So I’m not sure how the “genuine long-tail” gets drowned out by the “pseudo long-tail”. Regarding the discovery (and sales) of artists in the long-tail, it seems to me this issue isn’t specific to digital music services. In music retail stores, there is also a small number of top-selling popular artists and a long-tail of rather unknown artists. Sebastian – there is no doubt that the bigger acts are the ones who attract this sort of activity. However, they are also the ones (usually) with larger catalogues and their impact on total catalogue sizes (when coupled with covers etc) becomes disproportionately large. Looking quickly at a couple of established but less well known acts we see few covers but much smaller overall catalogues: The Hold Steady – 191 total tracks, The Maccabees – 129 total tracks. Re: the Long Tail in the high street – this isn’t just about the long tail, it is about the genuine long tail being obscured by the psuedo long tail. The vast majority of this content would never make it into a retail store. Additionally, finite shelf space in high street stores means that the long tail is inherently much shorter than online. Ok, SO WHAT!!? That is what search engines are for. If 90% of the music is covers, this must be a good time to be a publisher. 🙂 If they leveraged themselves $10-25 a year for each song, on the percentage of songs that have never been sold once, they would make a lot of money ….. or people would think twice about posting in the long tail services. Leaving that mess to YouTube to figure out. Amen MM! Great to see someone taking on this big, but largely unknown issue. The ‘so what’ here is that nearly every digital music service trying to bring fans great music and a great user experience spends a disproportionate amount of their engineering resource and infrastructure moving around, filtering, ingesting and accounting for tracks that really amount to musical spam. As someone who works at a company that powers many of these music services, I can tell you that the amount of time, money and effort that goes into fighting this flood of sound-alikes, fake titles and other stuff is certainly distracting these services from pushing forward the user experience we all want them focused on. Kaycie – the filler tracks actually dilute and pollute search results. For example, the Skakira track ‘She Wolf’ mentioned in the Guardian article I mentioned had to be released early because covers were beginning to chart. The problem is that end users often can’t tell the difference between the artist and the cover. Not every music consumer is a savvy music aficionado. The other issue is that the greater the number of pointless tracks, the more difficult it is to easily navigate to valuable content using navigation tools such as genre filters, alphabetical browsing etc. JL – ‘musical spam’ = nail on head! what is true to say is that there are multiple cover and karaoke versions of every ‘hit’ song: that hit songs make up only a small % of any mainstream music service’s total catalogue; that the majority of total repertoire (the long tail) gets little or no plays; and that ingesting, managing and making available millions of songs that never get played are real pain and cost to services. .
sadly the covers and tributes increasingly clog up search results which are usually hits-based, and often gain plays/sales by user error and/or cheeky tagging which then can fool automated algorithms into thinking they are popular. you would think proper label metadata could help sift out the shite, but without boring you all with the multiple technical challenges of running catalogues of this size, the reality is this is currently much harder than it should be. music labels have always released far too much product versus actual customer demand. they did it in the physical age and do the same now in the digital one. the trend is slowing but won’t change dramatically, despite more and more consolidation of the ‘superhits’ and ‘short head’. the secret for many users is to go with the services with the best curation to make the results feel personal and relevant and ignore all the dross. maybe pandora has it right for their sit-back audience with a catalogue of less than a million songs hand-picked by their ‘musicologists’. 150 million registered users seem pretty happy with their approach. many labels aren’t though. speaking personally, despite all the aggregation of content in recent years which has pumped up the size of services’ jukeboxes (particularly of non major-label repertoire), I’m regularly frustrated and disappointed by just how much plastic I remember buying in the past which isn’t even available yet digitally on frontline digital music services. i have access to all the UK streaming services, but often i can only find music I want to play on youtube uploaded by individual users. and sometimes not at all. so rather than suggesting there is too much music out there already, I think Mark you should ponder what isn’t out there yet ? and why not ? pose the question to major labels as to what % of their total recorded works have actually made it to digital services so far ? you might be surprised. there is still so much wonderful proven successful music to come onto digital music services. Hi Clive – I think we’re in violent agreement with regards to the importance of the long tail and of getting so much currently unlicensed catalogue onto digital services. I too have shelves full of vinyl that isn’t available anywhere digitally, including FWIW my singles and various remixes I did! But the issue of the filler drivel is I think bigger than you think, albeit also less marked than the 10% across all catalogue. But I do think the 10% rule applies to front line catalogue i.e. the 1% that makes up 80% of sales. And that’s why it matters so much. *The short head now has its very own long tail* And that is bad news for the real long tail. I also firmly believe the problem is rapidly accelerating in scale. And the ‘actual’ tracks are largely repetitions and remixes. In a ridiculously short period of time the bottom-feeder industry has created more than a 100 filler drivel versions of those brand new songs. For Tulisa and Rita Ora there are only two songs each in iTunes (strictly speaking it is only 1 song each but I am including collaborations in both cases). So on a strict song-to-song (not version) basis, that means that for every 1 song there are 82 filler drivel versions. That is a dramatically unhealthy ratio. The bottom feeder industry is aggressively targeting front line catalogue, meeting the insatiable appetite of music services and aggregators who want ever bigger catalogues. The impact of filler drivel is only going to intensify unless this problem is fixed quick. I agree Mark that the amount of filler of today’s pop gems is ridiculously high and negative to digital services. As long as they can get a few people to buy/stream fillers (often by mistake), the trickle incomes to filler producers will be enough to encourage more and more. Filtering systems at digital services have to evolve quickly to do much better than sorting alphabetically by artist/title/popularity – or the filler shite will quickly drive users away. Pandora’s hand-curation shows what can be done. We wouldn’t tolerate turning on the radio and hearing shite versions of hits. Why should digital be any different ? You’re right to identify that this is something that needs to be fixed immediately. By the way I don’t think any music fan is impressed at all by whether a service has 6 million songs or 16 million. “Do they have what I want to listen to ?” is the only question that matters. The numbers ‘chest-thumping’ from services is totally redundant to the user, and has no impact on the size of the ‘short head’. Most people listen to around 300 songs regularly. Many teens only to around 30 at any time. On WE7.com, 65% of plays came from the Top 100 artists at any moment whether we had 3 million or 11+ million tracks available. It’s the large-scale aggregators who have driven the recent massive expansion in catalogue. There are several, but just IODA and Orchard now represent around 4 million songs, including many cover/karaoke producers. This is not much fewer than all 4 majors combined. The difference is that the 4 majors produce 85% of plays on a mainstream site whereas these two combined might only make 4%. A brilliant label like the Beggars group can get 2% of plays from a tiny catalogue. I like the 50’s music comparison. Because 50’s were all about covers and tributes! Clive – you’re absolutely right to identify the disconnect between music services’ interest in vast catalogue counts and what actually interests music fans. Also I am too a big fan of curation: today there is so much choice that there is no choice at all. Mariusz – there are indeed parallels with the ’50’s but there are also dramatic differences. One of the most important ones is the fact that consumers increasingly seek content out for themselves now whereas in the 50’s they depended upon professional media to programme it for them on TV, radio and in magazines. So there was little risk of getting lost in a deluge of dross that was never ever intended for nor suited for prime time..
worked hard about. Just about any guidelines?